One of the most popular research papers on momentum is “Value and Momentum Everywhere” by Asness, Moskowitz, and Pedersen. I have an earlier post which discussed that paper. However, one important item slipped by me then. It was a statement by the authors that value and momentum premiums are negatively correlated. They cited a negative monthly correlation coefficient between value and momentum of -0.24. Asness and his crew brought up this negative correlation in subsequent writings regarding the merits of momentum and value investing. 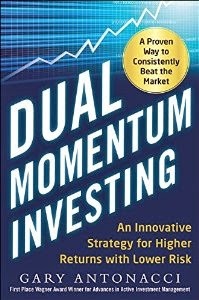 Other writers and speakers have also been expounding this idea of negative correlation between value and momentum strategies. However, the Asness et al. study dealt with long/short momentum and long/short value. This is where you are long high book-to-market and high price appreciation stocks, while simultaneously short low book-to-market and low price appreciation stocks. As we will see, the correlations between long/short value and momentum are substantially different than the correlations between long-only value and momentum. Why is this important? It is because the vast majority of the investing world uses long-only rather than long/short portfolios. This applies to both value and momentum strategies. In looking at dozens of mutual and exchange traded funds, there are very few value/growth oriented funds (other than those from AQR using muti-assets or multi-factors) that have a balanced long/short portfolio. With momentum, I know of only a single public fund (MOM) that uses a long/short approach. It is tiny with only $1.23 million in assets. Therefore, correlations between value and momentum using long/short portfolios are largely irrelevant and may be misleading to many investors. We will look at the correlations between U.S. value and momentum stocks using long-only portfolios from the Kenneth French Data Library. We will use the value weighted top one-third of book-to-market value stocks and the top one-third of momentum stocks measured over their prior 2-12 month's performance during the past 87 years. We will use stocks above the median NYSE in market capitalization..These are the ones that are most commonly traded. By using only large and mid-cap stocks, we avoid the problems associated with micro-cap liquidity. Besides looking at separate value and momentum portfolios, we will also examine a portfolio allocated 50/50 to value and momentum with monthly rebalancing. Our benchmark will be all stocks above the median NYSE market capitalization. No transaction costs or other expenses are deducted. The correlations of value and momentum to the market index are 0.92 and 0.90, respectively. As expected, these correlations are very high. What may not be expected is that the correlation between long-only value and long-only momentum is also high at 0.81. This is dramatically different from the Asness et al. 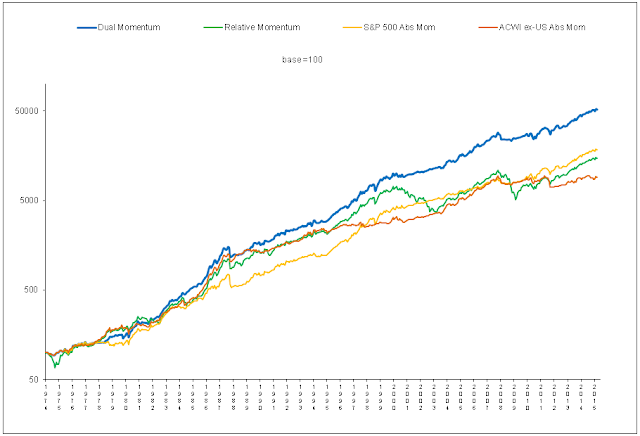 -0.24 monthly correlation between idiosyncratic long/short momentum and value. This difference has important implications for what long-only investors might expect if they invest in both value and momentum. The momentum portfolio has the highest return and the highest Sharpe ratio. However, a momentum portfolio of individual stocks also has very high turnover. There is some controversy as to how high the associated transaction costs may be. See Novy-Marx and Velikov (2014) for an up-to-date analysis of these costs and a review of earlier cost studies. Value shows almost the same return as momentum. It also has a higher Sharpe ratio than the large/mid-cap market benchmark.We should understand that if value and momentum had a low or negative correlation, then the standard deviation of a 50/50 mix of value with momentum would show a lower volatility than either value or momentum individually. That is not the case here. The standard deviation of the blended portfolio is higher than the standard deviation of the momentum portfolio. It is, in fact, almost identical to the volatility of the market portfolio. The same is true with respect to maximum drawdown. The market and value portfolios show the same maximum drawdown of -88 to -89%. This is based on month-end values. Intra-month drawdowns would be higher. I cannot imagine anyone being comfortable losing 90% of their portfolio value. The maximum drawdown of the momentum portfolio is a little better at -77.4%, but the maximum drawdown of the value/momentum blended portfolio is back up to -83.9%. So should there be value and momentum everywhere? We didn't think so before, and we don't think so now, at least not for long-only investors. Momentum without value shows the highest return, highest Sharpe ratio, lowest volatility, and lowest maximum drawdown. But its -77.4% maximum drawdown is still uncomfortably high, and high transaction costs may substantially reduce these momentum returns.